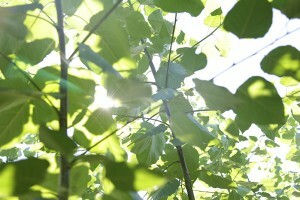 Poplar trees are useful in a variety of environmental applications, in addition to being a promising bioenergy crop. Poplar farms can sequester carbon, improve water quality, and cleanup contaminated industrial sites. Poplar can be used to “polish” treated wastewater, remediate contaminated soil, and contain landfill leachate and agricultural runoff. 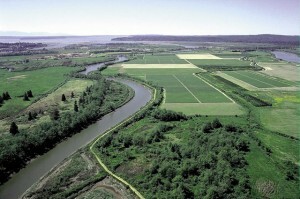 These topics and others are featured in the WSU Extension publication, “A Roadmap for Poplar and Willow to Provide Environmental Services and to Build the Bioeconomy.” A second WSU Extension publication (currently in-review) called “Growing Poplar for Environmental Applications in Washington State” will describe projects in Washington State where poplar is being grown for wastewater management, phytoremediation, landfill leachate control, among other uses. In the Pacific Northwest, several municipal wastewater treatment facilities use poplar as a tool for managing wastewater. Under certain circumstances (e.g., times of low flow), discharging treated water directly to rivers raises the water temperature, creates an excess of nutrients, or introduces contaminants-of-concern. This is a problem for the aquatic ecosystem and sensitive species, like salmon. Irrigating poplar (or other crops), instead of discharging to local rivers and streams, can protect water quality. Poplar crops can also utilize the treatment plant’s biosolids. This is important for treatment plants that do not have a sufficiently large local fertilizer market. Poop and Poplars: a Match Made in Heaven? Could Lewis County Be Home to the PNW’s First Commercial Poplar Biorefinery? Phytoremediation is a natural process that is used to capture contaminants in the environment. Sources of contamination include former industrial sites and landfills. 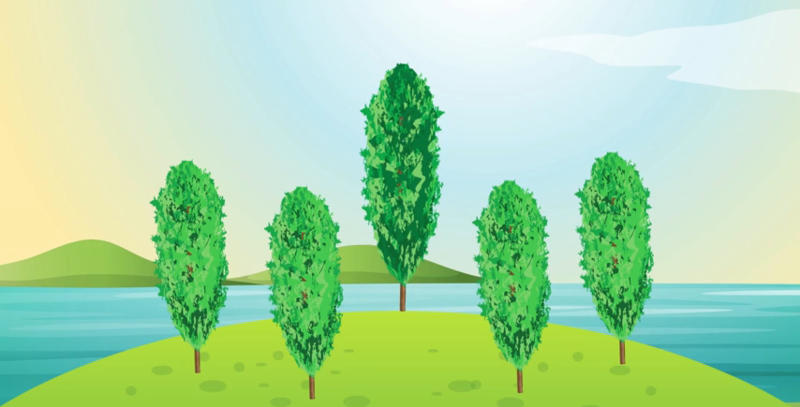 Poplar trees are excellent at phytoremediation because they can effectively remove, stabilize, and/or destroy contaminants in soil and groundwater. For example, poplar has been shown to have a natural ability to degrade the industrial solvent trichloroethylene (TCE) into harmless byproducts. Research is ongoing on the use and effectiveness of poplar in phytoremediation projects. To stay connected with current research findings from the University of Washington, visit Dr. Sharon Doty’s Lab webpage. In the Pacific Northwest, forested buffers are an important ecological feature of a functioning riparian ecosystem. Native trees and plants provide shade, nutrients, and habitat for the region’s rivers and streams. 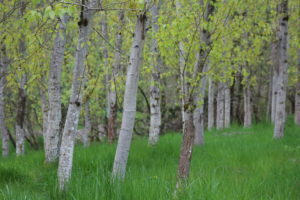 Poplar trees, grown in working buffers, could be an effective addition to riparian buffers that separate farmland from waterbodies. Working buffers describe trees and other biomass crops that are planted just inside of riparian conservation buffers. This vegetation can be periodically harvested, providing both additional water quality improvements and revenue opportunities. By harvesting the trees, the nutrients and other contaminates taken up by the trees are removed from the site entirely. Working buffers can supplement farmers’ incomes through water quality trading programs, conservation easements, carbon storage markets, and the sale of biomass. Converting agricultural land to forest can improve carbon sequestration and generate carbon credits. In the Mississippi Alluvial Valley, poplar trees are being used as a first step toward reforesting land that was cleared for ag land. Poplars can quickly grow and create a forest canopy on former agricultural land. Planted underneath the poplar are slower-growing, higher-value timber trees like oaks. As the oaks mature, the poplar are eventually harvested to make way for an oak bottomland forest.